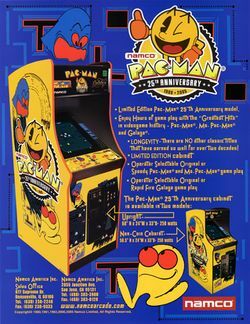 Pac-Man: 25th Anniversary is a compilation arcade game, that was released by Namco in 2005; as its name implies, it was released to mark the twenty-fifth anniversary for their most successful stand-alone arcade game, Pac-Man, and features a carbon copy of it (along with two more of Ms. Pac-Man and Galaga), in a cabinet with a Pac-Man-inspired artwork on its left side (and a Galaga-inspired one on its right one, even though Galaga does not have a connection to the Pac-Man series whatsoever). Pac-Man (1980): This is the second carbon copy of Namco's highest-grossing game of all time to be featured in one of their compilations; the first was for Namco Classics Collection Vol. 2 (1996), but the arcade operator could select either "Original" (normal) or "Speedy" gameplay for this one. Ms. Pac-Man (1981): Originally developed by Namco's old US distributor Midway Games without their permission, this is, again, the second carbon copy of the first Pac-Man sequel to be featured for one of their compilations; the first was for Ms. Pac-Man and Galaga: Class of 1981 (2001) but the arcade operator could again pick either "Original" (normal) or "Speedy" gameplay for this one. Galaga (1981): This is the third carbon copy of the second Galaxian game to get featured for one of Namco's compilations; the first two were in Namco Classics Collection Vol. 1 (1995) and in the aforementioned "Class of 1981", but the arcade operator could choose either "Original" or "Rapid Fire" (press and hold the button to fire continuously) gameplay for this one. Although Galaga has no connection to the Pac-Man series, Boss Galagans and Type 3 Zako (from Gaplus, 1984) both later went on to appear as two of the new bonus items in Pac-Man Championship Edition (2007). This page was last edited on 28 September 2015, at 16:16.